﻿ The title of this post is accurate: stray thoughts. So, yesterday someone in my husband's office asked him what he thought about MO Prob B, the Puppy Mill Cruelty Prevention Act. Gary told them he is in favor of it and plans to vote yes on Prop B. Their response: :"But what about all the dairy farmers?" Dogs. It's about DOGS. Not cattle. Not pigs. Not horses. Not cats. DOGS. Last week we were stunned to see the humongous billboard at our local MFA urging everyone to vote no on Prop B. After talking to the local MFA manager we contacted their home office. Sure enough, they've come out officially against Prop B. They view commercial dog breeders as agricultural businesses and are "supporting their customers." As we told them: we will never spend a penny with them again. Taking our business away from MFA will surely not bankrupt them. However, in this economy every penny counts and we hope they'll feel the ouch. We'll be buying our hardware odd and ends; birdseed;, garden seeds, plants and supplies; and our horse feed elsewhere from now on. Yes, we're boycotting MFA. And it's on my list today to review the members of the major groups fighting passage of Prop B. I'll be making notes of what businesses to add to our boycott list. We refuse to support any business that is publically, officially, in favor of animal cruelty, because that's what this is all about. The other day someone told me they were surprised that I'm for passage of Prop B. Afterall, my For Love of a Dog jewelry is sold to some folks who breed dogs. They wanted to know if my customers knew I was against dog breeding. Here we go again into the twilight zone. I'm not against dog breeding. I'm against the inhumane treatment of animals. I'm against cruelty. I'm against puppy mills that churn out hundreds of puppies each year that are produced in sub-humane conditions. No ethical, responsible dog breeder is raising puppies in the kind of situations that have been reported here in this blog, by the Humane Society of Missouri, or any number of national news reports. Read those reports. Read the reports of the US Department of Agriculture. 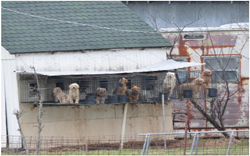 Take a look at this summary of the Dirty Dozen report on some of Missouri's worst puppy mills. You know that old figure of speech: "some of my best friends are..." Well, some of my best friends truly are dog breeders. I've helped whelp puppies. I've helped socialize puppies. I've cared for the dogs when my friends were out of town and gone along to shows and agility events to help handle the dogs. There's a day and night difference between responsible dog breeders and puppy mill operators. Responsible dog breeders have absolutely nothing to fear and, in fact, they're FOR Prop B. Prop B - it's about preventing cruelty to dogs.